SCOTTSDALE, Ariz. (Oct. 1, 2012) — It is with great pride that Fender announces the release of the GB Hot Rod Deluxe comboand GB Hot Rod Deluxe 112 Enclosure – two elegant performance machines designed in close collaboration with Grammy Award-winning jazz guitar virtuoso George Benson. 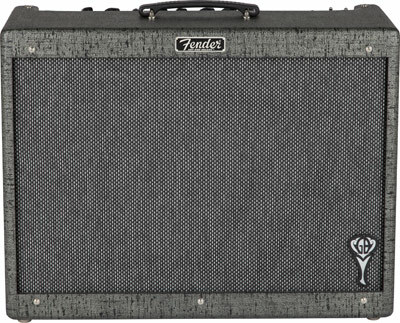 Meticulously engineered, the GB Hot Rod Deluxe is a striking 40-watt 1×12 combo outfitted in a gray-black vinyl covering, silver-strand grille cloth and a classy GB logo badge. It has the full bottom-end characteristic of 6L6 tubes, and a versatile all-tube preamp including a 12AT7 up front for cleaner tone, especially with humbucking pickups. A 100-watt Jensen® C12K speaker handles the immediacy of Benson’s singing soloing style with clarity and range, and the solid-pine cabinet increases tonal resonance while reducing weight. “Just to have my name on these is enough prestige for a guitar player from Pittsburgh, Pennsylvania,” Benson quipped.